Shades Creek trash/log jam between Highway 150 and Morgan Rd. Creek Cleanups are valuable for cleaning up communities and engaging local volunteers to help. Please, participate in cleanups when you can. There are also ways to keep your community and creek clean every day; that is by preventing trash from getting into streams to begin with. 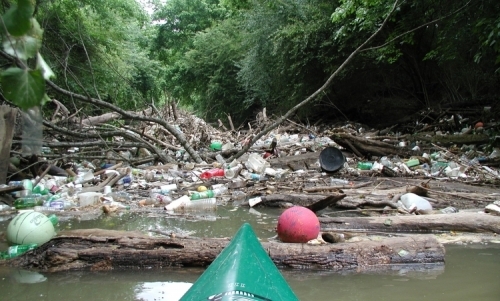 Trash and garbage pollutes streams, endangers wildlife, and litters our communities. Below, are ways you can help protect water resources and keep your community looking clean and neat. Never throw trash and litter out of your car window. Besides being unsightly, trash often collects in areas and can flow into waterways. Keep trash picked up around your yard at home and placed in trash containers. Garbage left lying around in yards attracts insects and scavenger animals. Don’t leave pet waste or pet waste bags along sidewalks or streets. Your neighbors don’t want to pick it up, nor do they want it left near their home. Carry it to a trash can! Contain trash in trash cans on collection days. Trash not in trash cans, can get blown and scattered in yards and streets in the neighborhood. Never put uncontained trash in the street or in the street gutter. Trash may not get picked up before the next rain and rains can wash uncontained trash into a storm drain. Materials washed into storm drains flush directly to streams where it can endanger fish and wildlife. Waste materials also can cause storm drains to get clogged, which cost cities money to unclog. Do not blow, rake or throw trash, leaves or waste material down storm drains. This can clog storm drains which can cause flooding on your street. Water and trash entering a storm drain goes directly into a stream. Storm drains do not empty at the waste treatment plant (only sewers do that) – they drain to the nearest stream. Unclogging storm drains cost money to fix. If certain trash items do not fit in your trash can, place them next to the garbage can up on the curb in your yard, or in a trash bag. Check your community’s garbage pickup rules and keep trash and garbage from getting in the street. Recycle cardboard and other items when you can. Never dump trash or yard waste in low or undeveloped areas. This causes areas in your neighborhood to become unsightly and attracts vermin. Never dispose of medications by flushing down the toilet or washing down a sink. Medications can hurt wildlife that live in our streams. Medications with hormones have been proven to affect the fertility of fish. Take unwanted medications to a receptacle at your local pharmacy or leave medications in their bottle and dispose of safely with your trash. Do not let chemicals such as automotive oils and chemicals, weed killers and other lawn products enter a storm drain or sewer. Auto repair businesses often take and recycle automotive oils. Watch for city sponsored disposal and recycling days for other hazardous products. Read and follow directions on product packaging about disposal.